How much worse can it get for Takata? Honda is dumping longtime supplier Takata over its deadly airbags. None of Honda's new car models under development will use Takata's airbag inflators, according to a company statement. Honda (HMC), one of Takata's biggest customers, also alleged Takata misrepresented and manipulated test data, and has requested the firm hire a third party to conduct an audit of test details given to Honda. "Honda expects its suppliers to act with integrity at all times and we are deeply troubled by this apparent behavior by one of our suppliers," the company said. This is the latest blow to Japanese auto parts manufacturer Takata. The company is struggling with a catastrophic fallout over its defective airbags, which can explode when activated, firing out shards of metal. They have already been linked to eight fatalities -- one in Malaysia, and seven in the U.S. Earlier on Wednesday, U.S. regulators slapped Takata with a massive $70 million fine for selling its botched inflators. Takata could be hit with an additional $130 million fine if it fails to adhere to safety measures going forward. The order by the National Highway Traffic Safety Administration requires Takata to phase out producing components similar to those known to have caused the malfunctions, and the company agreed not to take on new orders. 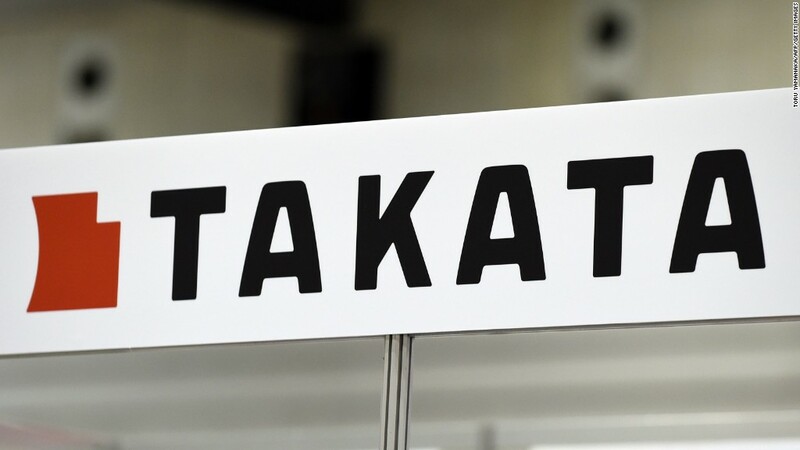 "For years, Takata has built and sold defective products, refused to acknowledge the defect, and failed to provide full information to NHTSA, its customers, or the public," said Transportation Secretary Anthony Foxx. Related recalls have affected at least 19 million cars in the U.S., and impacting a dozen of some of the world's most recognizable automakers, including Ford (F), Nissan (NSANF) and Toyota (TM). As of last month, fewer than 23% of recalled vehicles had been remedied, and some of those will still require an additional fix. The recall has been plagued by a shortage of replacement parts. Takata could face additional fines from a U.S. Justice Department investigation, and has been involved in multiple private legal actions. The company has already settled several lawsuits with victims. Takata's shares plunged nearly 19% in Tokyo in afternoon trading.